The 2014 I2SL Annual Conference has begun to take shape, and I would like to thank everyone who submitted abstracts this year. Your contributions have laid the foundation for a comprehensive and meaningful program of diverse sessions for conference attendees. In particular, look out for an opening plenary with speakers presenting Florida's high-technology plans, as well as a series of sessions featuring sustainability coordinators changing user attitudes and operational objectives in university and corporate laboratories. In addition, many I2SL Members will present or lead discussions. Among these are presentations on the initial components of the Laboratory Continuous Performance Improvement Program, the National Institutes of Health's Energy-Efficient Equipment Guide, university accounting for greenhouse gas emissions associated with federal research grants, energy service companies and client challenges in third-party financed projects, and more. Conference registration is now open, and I hope that you will join us at the Caribe Royale in Orlando, Florida, from September 22 through 24, 2014, for this great event. This year's Monday through Wednesday conference schedule offers the opportunity to wrap up the conference with working group and chapter meetings on Wednesday afternoon, leaving the remainder of the week for you to take advantage of Orlando's attractions and the Florida coast before heading back to work. What could be better than getting some Florida sun while earning up to 17 continuing education credits? I also encourage you to nominate outstanding individuals, projects, or products for a Go Beyond Award, which recognizes excellence in sustainability in the sustainable laboratory and high-tech facility industry. This year's winners will be recognized at the 2014 I2SL Annual Conference. I wish you all a great summer and look forward to exchanging ideas and expertise with you at this year's conference. Registration for the 2014 I2SL Annual Conference at the Caribe Royale in Orlando, Florida, is now open! By registering, you will gain access to workshops, exhibits, roundtable discussions, and technical presentations featuring the latest innovations in the sustainable laboratory and high-tech facility industry. Early registration includes a $100 registration fee discount and is open through Friday, July 25, 2014. Regular registration will be open from July 26 through September 12, 2014. I2SL Members will each receive a $100 discount off their conference registration. Visit the I2SL website to learn more about this year's event and to save an additional $100 by registering on or before July 25.
pre-conference training session qualify for up to 17 continuing education credits! You Know About Orlando's Theme Parks—Come See a Health and Life Sciences Park! Join I2SL for an exciting evening tour at Lake Nona Medical City in Orlando, Florida, on Tuesday, September 23, 2014. We will tour the the Sanford-Burnham Research Institute and the University of Florida Academic and Research Center. Transportation and dinner will be provided. Attendees will learn about Lake Nona Medical City, a 650-acre health and life sciences park, and will have the opportunity to go on a narrated drive through campus, where they will learn about the developers' plans for the campus. You can sign up for the tour when you register for the conference or add the tour to your existing registration. Do you know an individual, product, or project that has gone above and beyond? Nominate them for a Go Beyond Award! The Go Beyond Awards recognize excellence in sustainability in laboratory and other high-tech facilities, such as hospitals, data centers, and cleanrooms. Nominations for the 2014 Go Beyond Awards will be accepted in three categories: individuals, products, and projects. New this year, I2SL is offering a Building Information Modeling Project Award, initially sponsored by Deke Smith and Phil Wirdzek. 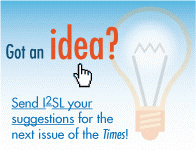 Visit I2SL's website for submission instructions, and submit your nominations by Monday, June 30, 2014. The winners of the 2014 Go Beyond Awards will be recognized at the 2014 I2SL Annual Conference in Orlando, Florida; on I2SL's website; and in a future issue of Laboratory Design newsletter. Sign up for an informative training session when you register to attend the conference or add a training session after your registration is complete. All of this year's pre-conference training sessions will take place from 1 to 5 p.m. on Sunday, September 21, 2014. If you would like to see your organization listed here, sponsor the 2014 I2SL Annual Conference! Opportunities start at just $500. The sooner you sponsor, the more time I2SL has to promote your contribution. Get your organization in front of Florida's booming high-tech industry by sponsoring the conference today! 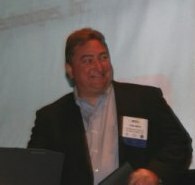 Tom Smith accepting his 2009 Go Beyond Award. The I2SL Board of Directors is pleased to announce that Tom Smith, founder and president of Exposure Control Technologies, Inc., has joined as I2SL's newest Board of Directors member. Since 1999, Mr. Smith consistently supported Labs21, and now supports I2SL in its mission. He is a leader in lab safety and energy management, specializing in helping laboratories to operate safe and energy-efficient laboratory hoods and ventilation systems. In addition, he is active in developing both national and international lab ventilation standards, having served as Chairman of ASHRAE TC9.10 Laboratory Systems, Vice Chairman of ANSI/ASHRAE 110 Fume Hood Testing, and Vice Chairman of ANSI/AIHA Z9 Standards for Ventilation and Health. His work has contributed to increased lab safety, reduced energy consumption, and lower operating costs. I2SL's Board of Directors looks forward to working with Mr. Smith and benefiting from his expertise. 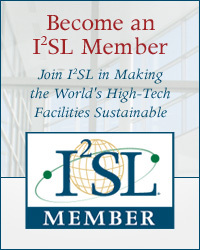 Reminder: All I2SL Chapter members must be I2SL Members, and I2SL invites you to join and take advantage of the growing benefits membership offers, including I2SL Annual Conference discounts. Visit the membership page to join and get involved with others helping to shape I2SL and its contributions to this community. In February, I2SL welcomed the Heart of America Chapter into our growing Global Community. 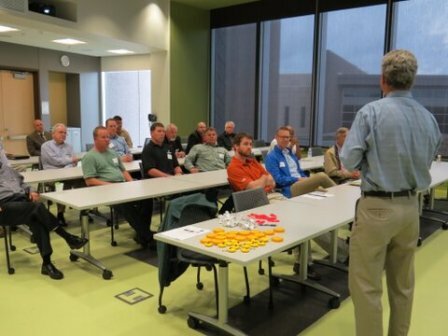 The Heart of America Chapter seeks to be the leading resource in the Kansas City, Missouri, metro region to advance the design, construction, operation, and maintenance of environmentally-responsive laboratories and other high-tech environments. The Heart of America Chapter, as well as I2SL's Colorado, Windy City, and New England Chapters, all held events during March and April of this year. The Chapters are now planning their next gathering, which may include a meeting at the 2014 I2SL Annual Conference. Learn about and get involved with your local chapter activities by visiting their Web pages. Chapter events include tours, presentations that can be worth continuing education credits, and networking opportunities. Chapter President Steve Black speaks to the I2SL Heart of America Chapter's inaugural meeting attendees at the Johnson County Sheriff's Office Criminalistics Laboratory. If an I2SL Chapter does not exist in your region and you are interested in starting one, please contact us. Additional chapters are being organized in Washington, D.C., Philadelphia, Pennsylvania; North Carolina; Florida; the San Francisco Bay Area; and Seattle, Washington. If you are interested in joining one of these planning groups, please email us. Are you looking for a new career, or do you know someone who is? Visit the job opportunities section on I2SL's website to learn more about job opportunities in the sustainable laboratory or high-tech facility industry. In addition, if you have a job opportunity that you would like us to share, please contact us. The Fulbright Scholar program is now accepting applications for 2015-2016, with up to 24 grants available for U.S. scholars to perform research in Austria. These grants include one research grant, teaching grants with research options, one Distinguished Chair teaching award, and one artist-in-residence award. Visit Fulbright's website for information about the grants and the application procedures. In addition, U.S. students interested in the program can apply for the Fulbright U.S. Student Program. In fall 2013, the U.S. Department of Energy (DOE) published a new addition to its retrofit guide series. The Advanced Energy Retrofit Guide (AERG) for Healthcare Facilities provides building owners and managers with information on effectively planning and implementing performance improvements in existing buildings (e.g., hospitals, small outpatient facilities). Using the guide, building owners and managers can learn how to calculate the cost-effectiveness of the most important and relevant energy efficiency measures and can also review best practices for taking action throughout various stages of the retrofit process. To learn more and to download the AERG for Healthcare Facilities, visit DOE's website. Energy-efficient initiatives are paying off in a big way, according to the International Energy Agency (IEA). A recent IEA report claims that avoided energy use attributable to energy efficiency investments undertaken since 1974 have significantly reduced the annual consumption of oil, natural gas, electricity, and coal. IEA performed an analysis of the energy consumption of 11 IEA member countries, including the United States, throughout 2010. The results indicated that annual avoided energy use in these countries during 2010 was larger than the countries' consumption of oil, electricity, natural gas, and coal. In the report, IEA states that increases in energy savings can be attributed to governmental policy interventions, changes in codes and standards, high energy prices, and performance improvements in buildings. Continued savings are expected throughout the next decade. To learn more about how energy-efficient investments are significantly reducing energy demand, read the IEA report executive summary. At the University of California, Irvine, getting "smart" about laboratory energy efficiency paid off for the entire campus. DOE recognized UC Irvine as the nation's first educational institution to meet its Better Buildings Challenge goal of improving campus energy efficiency by 20 percent by 2020. UC Irvine surpassed this goal in 2013, with campus energy consumption totaling to 23 percent less than the 2008 baseline. A major contributor to this success has been UC Irvine's Smart Labs Initiative, which focuses on reducing energy use and carbon emissions in laboratory buildings. The program reengineers building control systems, and additional measures include upgrading lighting, retrofitting heating ventilation and air conditioning, and executing information technology and data center efficiency projects. Wendell Brase and Matt Gudorf represented the Smart Labs team at the Better Buildings Challenge recognition ceremony on Wednesday, May 7, 2014, at the White House. Learn more about Smart Labs at UC Irvine in I2SL's E-Library. Pre-Conference Training Sessions will occur on Sunday, September 21, 2014. Nominations for the 2014 Go Beyond Awards are being accepted until Monday, June 30, 2014. If you know a person, product, or project that achieved excellence in sustainable laboratories or high-tech facilities, don't wait—nominate! The deadline to book a hotel room at the discounted block rate for conference attendees is Thursday, August 21, 2014. Make your reservation today to take advantage of this offer at the Caribe Royale. Online registration for the 2014 I2SL Annual Conference is open now through Friday, September 12, 2014. Register on or before July 25 to receive a discounted early registration rate. Stay tuned for more information about the summer webinar schedule. Bring energy efficiency to your laboratory with the Labs21 Technical Bulletins. Discover information on the design, construction, and operation of technologies contributing to sustainability in laboratories. Tim Kehrli, TLK Associates • Jim Plourde, Schneider Electric • Tom Smith, Exposure Control Technologies, Inc.